Upon his arrival, Butternut Creek Christian Church's newly-minted minister is met by a welcome committee led by Miss Birdie and her friend Mercedes, a.k.a. "the Widows." Their first order of business, to educate him on how things should be done, quickly gives way to a campaign to find him a wife. When their matchmaking efforts fizzle, the Widows turn to another new bachelor. Amputee and Afghan vet Sam simply wants to be left alone-- a desire that's as good as a red flag to the Widows! 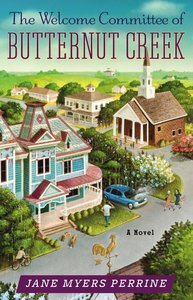 Soon they're scheming to pair him up with Willow, his beautiful physical therapist, a divorced mother of two who is afraid of commitment, Perrine's small-town tale is a big-time triumph of gentle humor, fast-paced plot, and wonderfully engaging characters. About "The Welcome Committee of Butternut Creek"